I will trust in you Lord, and I’ll commit my way. I need you every hour, your guidance day by day. And so I sing your praises, and glorify your name. You roll the clouds away, bring sunshine after rain. You light the path ahead; give strength to carry on. You pour out loving kindness, and fill my heart with song. Sometimes I grow weary, my home seems far away. I will rest in you Lord, not fretting come what may. I know that you are with me; you answer when I pray. 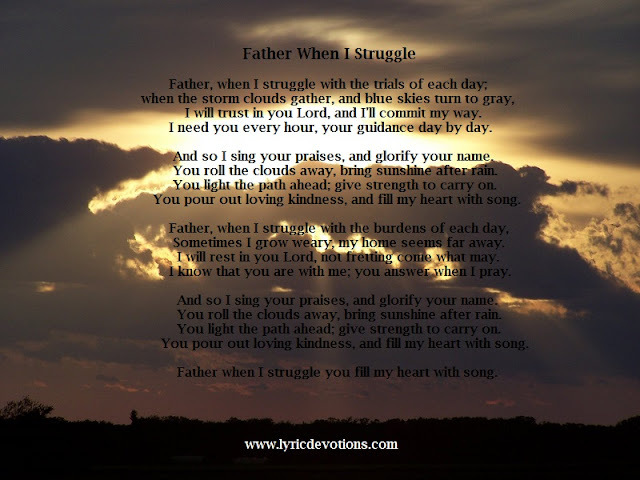 Father when I struggle you fill my heart with song. Psalm 28:7 The Lord is my strength and my shield; my heart trusteth in him, and I am helped: therefore my heart rejoiceth; and with my song will I praise him.